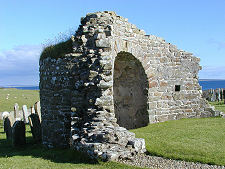 In the south of the West Mainland of Orkney, near the Hoy and Flotta ferry terminus at Houton, is a side road off the A964 complete with tourist signs directing you to the Earl's Bu and Round Church. 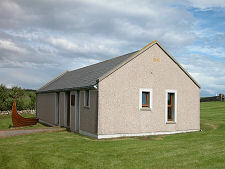 Natural curiosity leads you a short distance along a single track road to a parking area at the Orkneyinga Saga Centre. To get to the Earl's Bu and the Round Church of St Nicholas you follow the path past the Saga Centre. 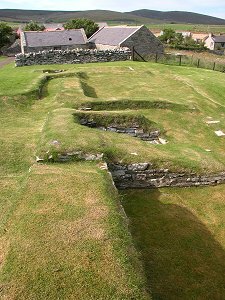 The Bu was a manor house of the Norse Earls of Orkney and dates back to the 1100s. It was made up of farm buildings, a mansion and a drinking hall. Before you get your hopes up too far, however, it's worth knowing that there isn't very much left of the Bu. A few courses of foundations and some shapes in the grass, and that's about it. It takes a little imagination to think of this as the place where, according to the saga, Earl Haraldr died in 1127; to realise that the drinking hall was the site of the murder of Sveinn Brestrope in 1136; or the place where Earl Haraldr Maddadson hid from his enemies in 1154. 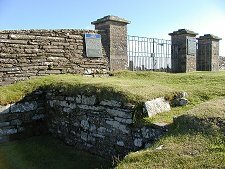 The Orkneyinga Saga adds names and imagined faces to the ruins and suddenly it becomes possible to think of real people living and dying here. There is more to see through the nearby gates in the churchyard housing the remains of the circular church of St Nicholas. This was built in about 1123 and is thought to have been modelled on the rotunda of the Church of the Holy Sepulchre in Jerusalem. 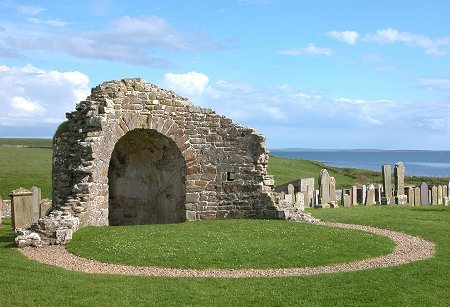 After the first crusade Earl Håkon of Orkney had been on pilgrimage to Jerusalem to do penance for ordering the murder of Earl Magnus,	later Saint Magnus, on Egilsay on 16 April 1117. 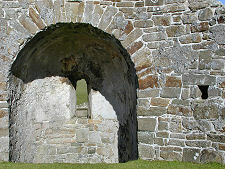 St Magnus's lasting memorial was St Magnus Cathedral in Kirkwall. Earl Håkon's less enduring memorial was St Nicholas Church. It was less enduring because in 1757 most of the church was destroyed to provide stone for a new parish church nearby, itself also now long gone. 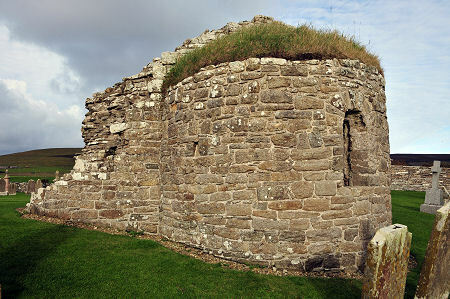 All that remains is the semi-circular apse and the circular markings on the grass of the shape of the original church. You can see more than enough to realise that St Nicholas's destruction in 1757 was a sad loss. The surrounding churchyard is fascinating. 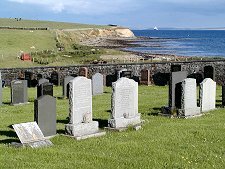 As well as the church itself, it houses a remarkable collection of grave stones and markers, all with stunning views over Scapa Flow. This is a slightly odd group of attractions: the remains of a church that was knocked down to build another church that is no longer there at all, and an Earl's homestead that is even less substantial on the ground. But the blood of the Vikings flows through Orkney's veins and you see evidence of them everywhere you look in these islands, and here you can alsmost see the this Viking influence take shape and form. 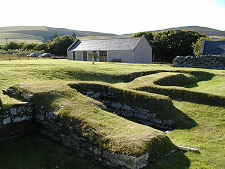 The Orkneyinga Saga Centre helps set all this in context and is also well worth a visit. It may not seem open, but turned out to be when we tried the door.